Home → News → Company news → Win a luxury Christmas hamper! The competition is now closed. The winner will be announced shortly – keep checking back! Christmas is drawing closer so why not kick off your festive celebrations by entering Spirotech-SRD’s 2018 prize draw for the chance to win this luxury Christmas food and drink hamper. Beautifully presented in a traditional wicker basket, Spirotech’s 2018 prize draw Christmas Hamper is full of the most alluring range of sweet and savoury luxury treats, with something for everyone to enjoy! All you have to do to enter is send your name, company name and email address to Spirotech-SRD by the end of Monday 10th December 2018 and your details will be entered into the draw. The winner will be the first entry drawn out on Tuesday 11th December 2018. 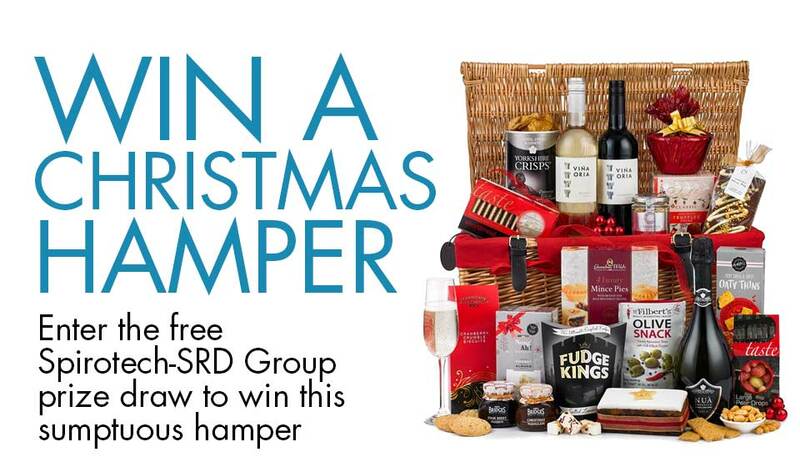 Spirotech-SRD is offering a lucky winner a sumptuous Christmas Hamper choc full of the most delicious goodies. 1. Please note that by entering Spirotech’s prize draw you agree that your email address will be added to our list of email newsletter subscribers to receive news and updates about Spirotech’s products, services and other prize draws throughout the year. You can use the Unsubscribe button at the bottom of each email newsletter at any time in the future. 2. For the avoidance of doubt any personal data relating to participants will be used solely to market Spirotech-SRD services and offers and in accordance with current UK data protection legislation. 3. Participants may only enter into this competition once. 4. To enter participants must be 18 years or over at the time of entry. 5. The competition will run from 09:00 on Wednesday 7th November 2018 to 23:59 on Monday 10th December 2018. The winner will be notified on Wednesday 12th December 2018. The winner will be chosen in front of an independent observer (the “Observer”) at random. If we do not get a response from that email within 24 hours then we reserve the right to offer the prize to another customer. 6. Winners will be notified by email. Spirotech-SRD’s decision will be final, and no correspondence will be entered into. 7. Once the prize draw has taken place, participants can obtain details of the winners by contacting Spirotech-SRD by post. 8. By entering the promotion the prize winners agree to participate in publicity and material resulting from the promotion if requested to do so by Spirotech-SRD. Spirotech-SRD reserves the right to use the details of the prize winners in any publicity or material. 9. The promotion is not open to employees (or members of their immediate families) of Spirotech-SRD or any group company, subsidiary, subcontractor of Spirotech-SRD or anyone professionally connected with the promotion. 10. The prize is for: a Christmas Hamper. 11. The winner must be 18 or over on the day of event. 12. The prize is as described, not transferable, not exchangeable for cash and no cash alternative will be offered in the event that the winner is unable to claim or use the prize for any reason. 13. Spirotech-SRD reserves the right to amend the terms and conditions at any time. If Spirotech-SRD do this it will publish details of any changes on this page. 14. By entering the promotion, participants agree to be bound by these terms and conditions and by the decision of Spirotech-SRD in relation to all matters relating to the promotion, which shall be final. 15. Spirotech-SRD cannot accept any responsibility for any damage, loss, injury or disappointment suffered by any participant entering the promotion or as a result of accepting the prize. Spirotech-SRD is not responsible for any problems or technical malfunction of any telephone network lines, computer on-line systems, servers, or providers, computer equipment, software failure of any email or enter to be received on account of technical problems or traffic congestion on the internet, telephone lines or any website, or combination thereof, including any injury or damage to participant’s or any other person’s computer or mobile telephone related to or resulting from participation in the promotion. Please note that the hamper contents may vary to those shown in the photograph.